Here is the perfect Pinterest account to follow, The Los Angeles Times. The paid photographers of newspapers and magazines are the ideal users of Pinterest. After all, they are trained professionals in the art of awesome photography. While most of us are creating boards called “Things I like” and “My Style” they are doing things like “Cityscapes at Dusk” and “Photos of Celebrities at the Oscars”. Getting to places we often can’t get to and going to places we are too busy (or lazy) to go to. At least, that’s my thought on the subject, and my argument for print publications to rock Pinterest. They can only make the site better. Because, I mean, haven’t you fallen in love with Pinterest? Newspapers lose $25 billion in revenue – where did it go? US newspaper publishers’ hopes that advertising revenues might be about to stabilise have been dashed by several pieces of research. An analysis of data predicts that newspapers will achieve a new low in ad sales for 2011, with revenues expected to come in at about $24 billion this year (2011) – down from the record $49.4 billion achieved in 2005. 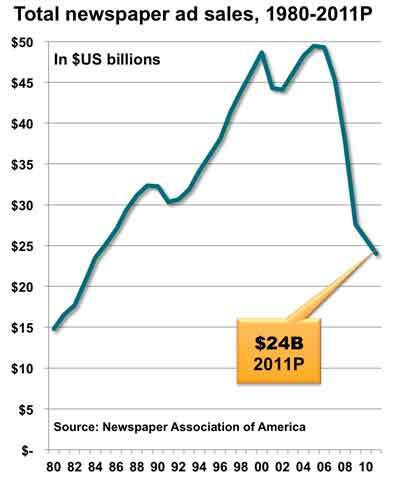 The last time newspaper revenues were this low was 1984. National advertising fell by a bit less than 11%. The only bright spot was digital advertising, which climbed 8.3%. This year was the year that many publishers believed an improving economy would halt, if not reverse, the revenue slide that commenced in the spring of 2006. Technically, the economy did rebound in 2011, but the uptick bypassed newspapers. My heart goes out to all those in the industry. With one question, where did $25 billion in lost revenue go. What multi-billion dollar industry has replaced it? It’s possible it went to the digital world, where newspapers are completely out of touch with only a few success stories. Posted on March 6, 2012 Author robotchampionCategories defaultTags advertisting, billion, classified, magazines, national, national advertising, newspaper, publisher, retail, retail advertising, revenue, salesLeave a comment on Newspapers lose $25 billion in revenue – where did it go? Will Apple’s iBooks Author open the door for a new form of journalism? As a journalism instructor, it’s iBooks Author that has me most intrigued…because it’s not just for textbooks, and not just for textbook publishers. It is a fantastic tool for communications professionals, including journalists. Let me cut to the chase: I think iBooks Author could be the platform for a whole new form of rich-media, long-form journalism. We now have, for free, a tool that lets us tell stories and present stories that combine all the interactivity and engagement we could dream of. In a single tool, I can combine what would have been done via video clips, feature stories, podcasts, photo essays, study guides and polls. It’s a platform that encourages readers to touch, listen to, watch, engage with and learn from your story. Right now, newspapers and magazines should be figuring out how to turn their best long-form work into iBooks. They should be considering doing iBook-only special projects. And, you can bet my journalism students at Western are going to be all over this when my online journalism class starts next month. Posted on February 11, 2012 Author robotchampionCategories defaultTags apple, author, books, engage, ibooks, ibooks author, ipad, ipad2, journalism, long-form journalism, magazines, wayne macphailLeave a comment on Will Apple’s iBooks Author open the door for a new form of journalism? Will Apple's iBooks Author open the door for a new form of journalism? Posted on February 11, 2012 Author robotchampionCategories defaultTags apple, author, books, engage, ibooks, ibooks author, ipad, ipad2, journalism, long-form journalism, magazines, wayne macphailLeave a comment on Will Apple's iBooks Author open the door for a new form of journalism?